Eagle Scout's Story . . .
Eagle Scout continues to learn what is expected of a well-behaved Springer boy. 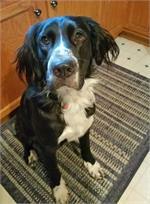 He is completely housetrained now and is working on his recall. At the moment he is getting better inside of the house with coming when called, but outside he is a work in progress where his only recall skills involve a squeaky toy. After three days of perfect retrieval during ball playing, curiosity got the better of him when the trash cans at the end of the driveway required investigation. Eagle Scout went on a tour, as he just kept on running after checking out the cans. His foster mom was able to secure him at a neighbor’s house…a long way up the road. Even though he doesn’t care to go potty on a leash, after that jaunt he didn’t have a choice! 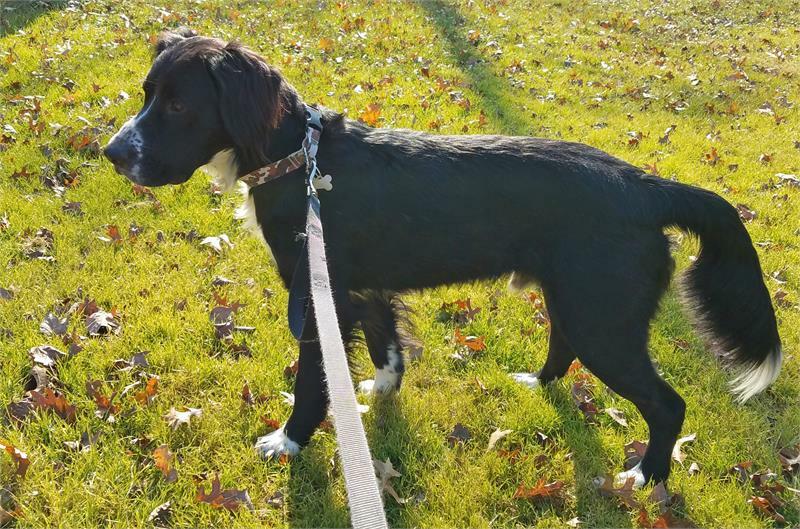 Due to Eagle Scout’s strong call of the wild, MAESSR is requiring his adoptive family to have a fenced yard and to take him to one series of obedience classes. The classes will strengthen the bond between human and canine as well as help Eagle Scout to understand expectations. This smart boy should catch on quickly. A new term that Eagle Scout has learned is “kennel up.” This is what his foster family says to their crew when they have to go to their crates. He is crated when they are away and also at night since he is a chewer. Now that he’s becoming a little more assertive with the pack…mainly with the grumpy resident male in the house…there have been a few scuffles; but a vinegar and water spray bottle works wonders to correct any unwanted behavior from both dogs. 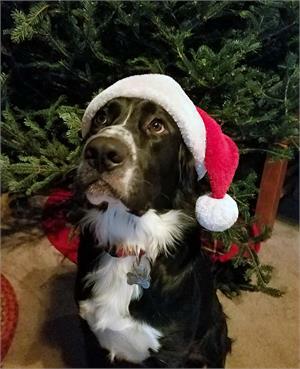 Eagle Scout’s foster mom believes that he would probably do best with a forever family that has children older than five, as younger ones could be knocked over due to his enthusiastic play. This boy loves kids and attention, so an active family would be on his wish list. Also, another mid- to large-sized dog that loves to wrestle and play would be a super companion for Eagle Scout. His foster mom cannot begin to say enough about Eagle Scout’s sweet and loving personality. He truly is an absolute love bug and loves to get hugs and kisses from his humans. He thinks that he is a lap dog and, at 70 pounds, takes up an entire lap! If your family sounds like a good fit for this sweet, fun-loving boy, ask about Eagle Scout. He’s fully prepared to be your faithful companion. A rescue group in North Carolina notified MAESSR about a stray Springer they had pulled from a shelter. Could we help? Of course! That stray was Eagle Scout and he quickly became a MAESSR boy. Eagle Scout is often referred to as the “gentle giant” by his foster family because of his sweet and gentle personality and his size. He is a big boy but that doesn’t stop him from wanting to snuggle and think he is a lap dog. He loves to give kisses and sometimes will even give hugs. He is working very hard on housetraining and has come a long way in the short time he’s been in foster care; however, he has a little work to do to be completely housetrained. He is crate trained and does very well in his crate. He is only crated when his foster family members are away and at bedtime but is allowed to snuggle in bed for a bit before going to his crate. This high ranking scout gets along GREAT with other dogs and loves to run and play with them. Since he is a big boy, playing sometimes gets a little rough for the resident pack, but Eagle Scout takes correction very well from them. He has not been cat tested in his foster home but his foster mom suspects that he might chase a cat if it would run from him. When the other dogs are not willing to play, Eagle Scout loves to chew on his toys, so much that there is no squeaker toy or tennis ball that is safe as he must get those squeaky things and the stuffing out of them! He is a very laid back guy other than his play time with the other dogs. He does like to sit on the furniture with his people but also likes the big dog bed in the living room. Eagle Scout is perfect around the 11 year old and 15 year old sons in his foster family. He is so gentle with them and loves to give them kisses. He lets them know that he wants them to pet him by putting his paw on their arm and won’t stop until they either give him a hug or pet him. The only concern with younger children would be that if his potential family has another dog that likes to play, the younger kids could inadvertently get knocked down during the dogs’ run around the house. Getting a forever home tops Eagle Scout’s Christmas list. Santa, are you listening?